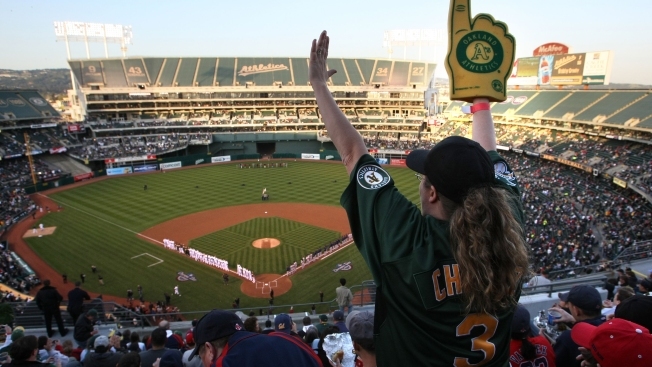 A file image of an A's fan cheering before the start of a game at the Oakland Coliseum. The Oakland Athletics took a playful poke at their cross-bay rivals on Saturday, promising to charge San Francisco Giants fans more for Oakland Coliseum parking, and BART promptly capitalized on the joke. Oakland announced Saturday that parking will cost $50 for Giants fans for the 2018 season. A's season-ticket holders can get prepaid parking for $10 and other Oakland fans will pay $30, the team announced.